Join the fantastically popular, Mister Maker and his friends to make fabulous art projects. 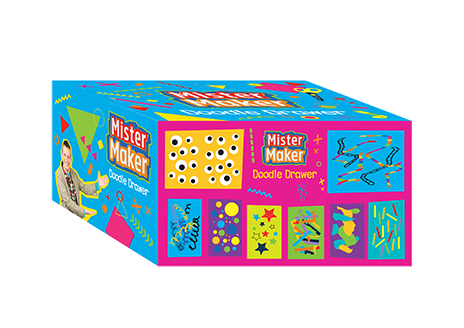 These terrific doodle drawers provide little ones with everything they need to create fun and imaginative art projects that will keep them entertained for hours! Let their imaginations run wild, the possibilities are endless! 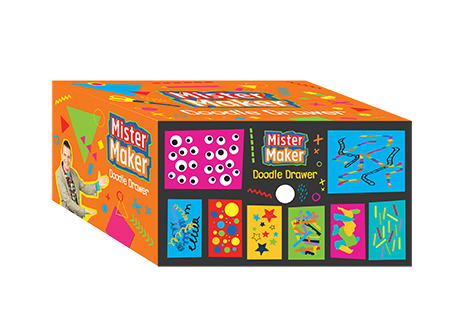 Make the following Mister Maker craft projects: Funny Disguises, Play Stick Puppets, Build a Scene. All these goodies are packed into a sturdy cardboard drawer, so nothing will ever get lost! Easy pull out drawer is perfect for little fingers. Pack your other art supplies to keep everything in the one spot. Make the following Mister Maker craft projects: Pom Pom Pets, Sock Monsters, Funky Masks. All these goodies are packed into a sturdy cardboard drawer, so nothing will ever get lost! Easy pull out drawer is perfect for little fingers. Pack your other art supplies to keep everything in the one spot.